Mark Cree keeps on winning at Float Fish Farm. Local rod Stan Binge was in superb form for England at the weekend, helping them to a bronze medal in the World Veteran Championships in Croatia and claiming individual silver. The Huntingdon tackle dealer fished for the England Over 65s team on Lake Selnica and in sizzling temperatures well into the 30s, Binge performed with distinction. While most fished for small fish, Binge gambled on a big float and bait approach which gave him two section wins and the individual silver medal, beaten only on weight for the gold. For the record Hungary won gold and Italy snatched the silver on weight from England who had the same points. Italy’s Roberto Torri pipped Binge to the individual gold. In the Preston Innovations Feedermasters Qualifier at Ferry Meadows a few of the resident bream fed to save the day. But the weights were nothing like we have come to expect, due many feel to the really hot, sunny conditions. Top rod with a modest 31lb from peg 70 was Mike Vials. Result: 1 M. Vials (PI Sonu Baits) 31lb, peg 70; 2 S. Ellis, 25lb 14oz; 3 G. Ringer (Ringer Baits) 21lb 3oz; 4 N. Truman 14lb 8oz; 5 D. Clough, 14lb 4oz. Qualifiers: D Clough, M Vials, S Ellis. On Sunday Peterborough & DAA held a match on the North Bank of the River Nene but like quite a few other natural venues it failed to produce. 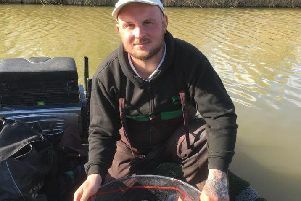 Matchwinner Pete Jayes did, however, manage to catch a bream or two from the end peg weighing in 11lb 6oz. Result; 1 P. Jayes (Wigston) 11lb 6oz; 2 P. Cuddy, 3lb 14oz; 3 J. Price (Sensas Mark One) 14oz. Frank Bevilacqua won the Yaxley, Farcet, Holme and DAC sweepstake at Haddon Lodge. He drew one of the fancied end pegs and took full advantage as he was able to fish three totally different swims, but opted for the narrowest part of the lake for most of the day and caught his biggest fish there with red maggot on the pole. He caught five carp late in the match to add to a few other small fish for his top weight of 5lb 15oz. Runner-up was Mike Mohan with 4lb 15oz and third was Lionel Whaley on 4lb 6oz. The matches come thick and fast at Float Fish Farm Fishery. In the latest Wednesday Over 50s match it was Sean Best topping a good field from peg eight with 158lb 13oz followed by Roy Well with 104lb 14oz and Mike King with 86lb 14oz. The popular Saturday Opens on a full Two Island Pool saw Mark Cree make it four wins on the trot, an unbelievable record as the quality of anglers fishing is high. Drawn on peg one, he started on the feeder and caught well before switching late on in the match to the pole and margins where he caught carp to double figures to finish with a fine 136lb 1oz. Second was Mark Carter on peg 23 with 84lb 12oz followed byAshley Kinsey with 80lb 15oz from peg five. The Castaways Angling Club have a liking for Biggin Lake at Oundle and you can see why after yet another successful day there for most anglers. First from peg 42 with a weight of 105lb was Paul Dotchin catching big carp on the pole on cat meat and sweetcorn at 11 metres. Coming a close second was Alan Jopling with a level 100lb and third place went to Clive Cole with 53lb. Webbs AC were back at Kingsland Fishery on Sunday, this time fishing the Silver Fish Pool. Top rod with 47lb 8oz was Peter Harrison, who caught on the feeder with pellet. Runner-up with 41lb 4oz was Ray Gregory fishing prawns, followed by Gordon Harmer with 35lb. Ramsey & District Angling Society fished the Magpie Pool at Rookery Waters on Sunday which once again produced some fine weights for most anglers. Kieran Payne stood head and shoulders above the field though putting a huge 314lb 8oz net of fish to the scales from peg 12, fishing shallow with casters all day. Runner-up was John Payne on peg 10 with 205lb 8oz then came Keith Rayment with 121lb 4oz and Harry Young who had 85lb 14oz. The Saturday Qualifier on Jay Lake at Rookery Waters saw Wayne Shepherd on peg 19 take top spot with 158lb 11oz. He fished 6mm hard pellet to the far margin then started dobbing pellet in the margins for the last hour, landing fish to double figures. Second was Simon Godfrey with 143lb 14oz and third Simon Easey with 121lb 2oz.